Join us for this year’s Avon Hills Black Powder Shoot and Rendezvous in October(5th, 6th, & 7th 2018), in the beautiful Avon Hills for a weekend of shooting fun, learning, and outdoor fun. Black powder shooting, archery in the woods, tomahawk throwing, fall colors, camping, and more. All experience levels welcome! Never shot a muzzleloader? We’ll show you how! Kids events. Fall colors are usually nearing peak. The best time of the year! FROM THE EAST(STCLOUD) Take I-94 west to St. Joseph, take the exit, turning left onto County 2. Go under overpass, turn right onto County 51, go about 5 miles, watching for signs. ALTERNATE ROUTE FROM ST CLOUD: Go west on 75 to St. Joe, turn left onto County 2(set of lights with Super America), then turn right onto MN Street at the 4-way stop. Take MN Street(Cty 2) west out of town under overpass, then turn right onto County 51, follow for about 5 miles to event. FROM THE SOUTH(COLD SPRING): Follow County 50 about 8 miles to County 51, turning right onto 51. Take first left(driveway-Watch for signs). FROM THE WEST/NORTH: From Avon/I-94, head south, immediately turn left onto frontage road(County 50), go about 1/2 mile, turning right(south) by Columbia Gear/water tower toward Cold Spring. Follow Cty 50 about 4 miles to Cty 51. Left onto Cty 51, taking first left(driveway-watch for signs). BRING A CHAIR, YOUR OWN MUZZLELOADER/BOW AND GEAR IF YOU HAVE IT! WATCH THE WEATHER. OCTOBER 5TH 6TH 7TH 2018. SAFETY NEWS: AS ALWAYS WE HAVE 2 MINNESOTA DNR CERTIFIED FIREARM SAFETY INSTRUCTORS, ONE MINNESOTA DNR ADVANCED HUNTER EDUCATION INSTRUCTOR, AND SEVERAL ADULTS VERY EXPERIENCED IN FIREARM USE AND SAFETY ON HAND. 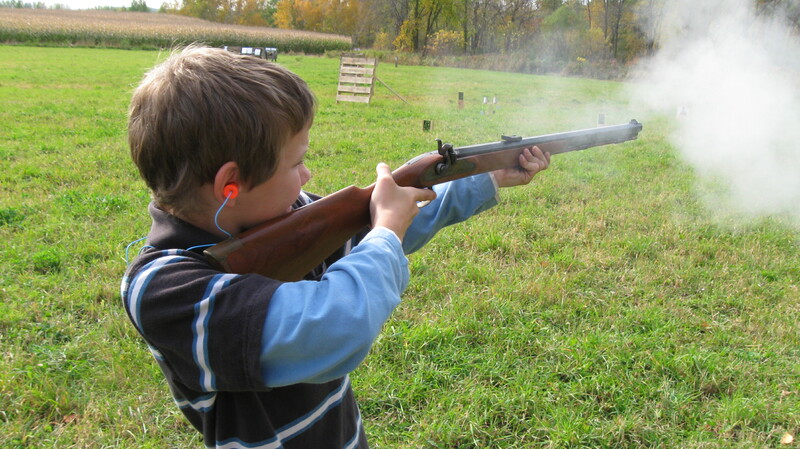 EYE AND HEARING PROTECTION REQUIRED AND AVAILABLE TO SHOOT ANY FIREARM. It’s getting closer…..put it on your calendar! Cliff, it would be great if you could make it! I’ve posted directions to the Shoot on the site(Black Powder Shoot).